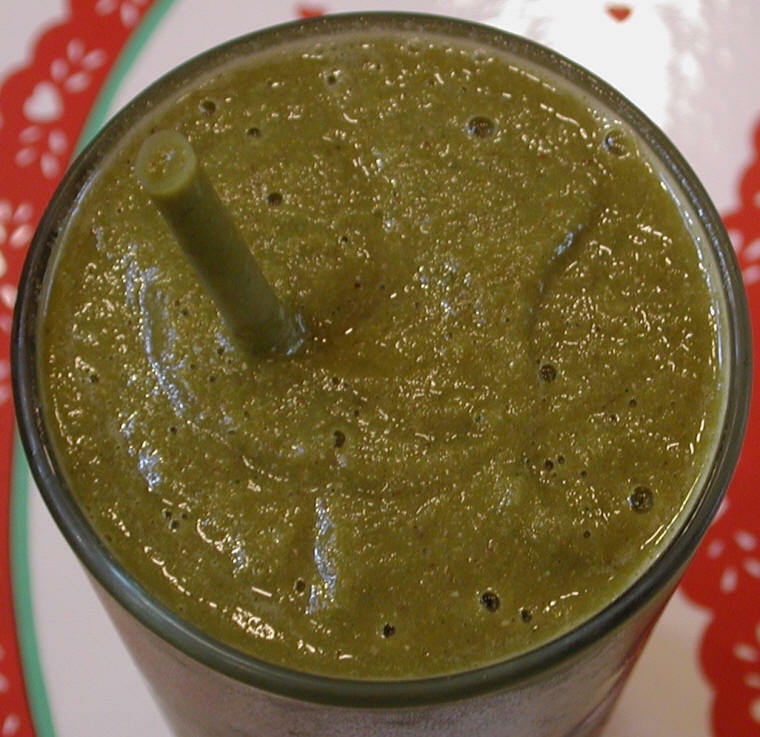 Collard greens zucchini green smoothie is a great way to begin the day. We each have three 12-oz. glasses of a green smoothie for our breakfast, so we usually completely fill the large container of our Vita-Mix high speed blender. We use about 1 to 1-1/2 pounds of greens in the recipe. Preparation time is about 15 minutes. If you wish to make a smaller amount, cut the recipe in half. Wash and peel the carrots and onion, cut into chunks, add to the blender container, and add the tomato paste, flaxseed, ginger and stevia. Wash and clean the zucchini and cut off the stem end, cut into chunks and add to the blender container. Wash and clean the fresh collard greens, and add to the blender container until it is 3/4 full with the fresh, frozen or cooked collard greens, add the ice and a cup of water, cover, and run the blender at high speed until the ingredients are smooth, using the tamper as required. Add additional collard greens and water to fill the container and achieve the desired consistency of the green smoothie. Sometimes the collard greens can be a little bitter, so taste the smoothie, and if necessary add a little more stevia.